Ryan Tafazolli of Peterborough United celebrates with team-mates after scoring his goal. Picture: Joe Dent/theposh.com. Peterborough United scored three times in the final 15 minutes to claim a memorable FA Cup win at Aston Villa today (January 6). Top scorer Jack Marriott scored twice and Ryan Tafazolli added a header from a corner to earn Posh a deserved 3-1 win. Posh striker Jack Marriott (14) heads his side level at Aston Villa to the delight of Steven Taylor and the despair of John Terry (right). Picture: Joe Dent/theposh.com. Villa had taken the lead after just eight minutes through Keinan Davis. It was a quite brilliant display from Posh who played the better football throughout once overcoming a nervous start. Villa made 10 changes to the side that contested their last Championship outing, but took just 20 seconds to warn Posh they were still fielding an abundance of talent. Andre Green was the man to threaten, turning inside to force Posh ‘keeper Jonathan Bond into a fine one-handed save from 20 yards. Ryan Tafazolli heads Posh in front at Villa Park. Picture: Joe Dent/theposh.com. Posh kept their promise to attack their higher-ranked opponents though with Danny Lloyd firing over on six minutes after a poor clearance from an Andrew Hughes cross. But it was Villa who took the lead as Chris Forrester intercepted a cross, but Anthony Grant failed to clear enabling Davis to pounce and score from eight yards. Posh wobbled briefly, but then created all the scoring chances for the rest of the half. Unfortunately they found back-up Villa goalkeeper Jed Steer in cracking form. 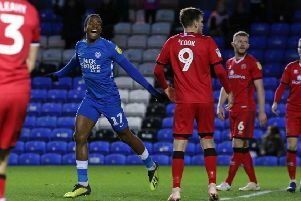 He saved well from Marcus Maddison and Leo Da Silva Lopes at full stretch before using his feet to thwart Marriott twice, the second time most imprerssively on the stroke of half time after Lloyd had played League One’s top scorer through. But it was recalled right-back Liam Shephard, playing his first game since late October, who almost broke the deadlock on 28 minutes with a looping header that struck the crossbar. Lloyd should really have converted the rebound, but drove the ball wide. Villa had former England star John Terry back at the back, but his presence merely emphasised a lack of speed which Posh kept threatening to exploit. Posh kept up the pressure after the break without creating the same number of chances and it took a fine save from Bond who dashed off his line to block Callum O’Hare’s shot to keep the deficit at one on 70 minutes. But pressure eventually told as Posh equalised on 76 minutes. A fine run from Forrester into the area was followed by a deep cross that reacahed Lloyd at the far post. He hammered the ball back across goal for Marriott to head home from close range. Ironically Villa had enjoyed their best spell prior to the equaliser and they should have re-taken the lead 10 minutes from time when Birkir Bjarnason volleyed against the crossbar from close range following a Conor Hourihane free kick. But Posh regrouped and Tafazolli leapt superbly to meet a Maddison corner with the ball travelling into the roof of the net off a Villa head. Bond made a couple of good grabs before Posh sealed victory with a terrific break out of defence, started by Anthony Grant, Lloyd and Junior Morias and finished when Marriott netted from Maddison’s perfect cross. Cue marvellous celebrations in front of pver 4,500 Posh fans. Posh: Jonathan Bond, Liam Shephard, Andrew Hughes, Steven Taylor, Ryan Tafazolli, Anthony Grant, Chris Forrester, Leo Da Silva Lopes (sub Junior Morias, 72 mins), Danny Lloyd, Marcus Maddison, Jack Marriott. Unused substitutes: Conor O’Malley, Jermaine Anderson, Alex Penny, Michael Doughty, Idris Kanu, Jack Baldwin. Aston Villa: Jed Steer, Ritchie De Laet, Neil Taylor, James Bree, John Terry, Conor Hourihane, Josh Onoamah, Andre Green (sub Henri Lansbury, 46 mins), Birkir Bjarnason (sub Jack Grealish, 80 mins), Callum O’Hare (sub Rushion Hepburn-Murphy, 80 mins), Keinan Davis. Unused substitutes: Mark Bunn, Tommy Elphick, Ahmed Elmohamady, Jack Doyle-Hayes. Goals: Posh - Marriott (76 mins & 90 + 3 mins), Tafazolli (84 mins). Villa - Davis (8 mins). Caution: Posh - Da Silva Lopes (foul). Attendance: 21,677 (4,600 Posh approx).